Quebec City, also known as Ville de Québec in French, is the capital city of Canada's Quebec province. Its 2016 population of 531,902 makes it Quebec's second most populous city (Montreal is the largest) and the eleventh most populous city in Canada. 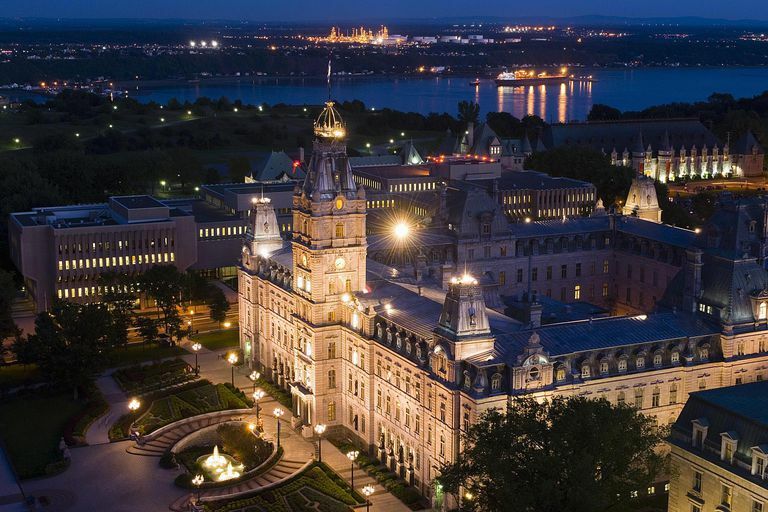 The city is known for its location on the Saint Lawrence River as well as its historic Old Quebec which features fortified city walls. These walls are the only ones left in northern North America and as such, they were made a UNESCO World Heritage Site in 1985 under the name Historic District of Old Quebec. Quebec City was the first city in Canada to be established with goals of being a permanent settlement instead of a commercial outpost like St. John's, Newfoundland and Labrador or Port Royal Nova Scotia. In 1535 the French explorer Jacques Cartier built a fort where he stayed for a year. He returned in 1541 to build a permanent settlement but it was abandoned in 1542. On July 3, 1608, Samuel de Champlain founded Quebec City and by 1665, there were over 500 people living there. In 1759, Quebec City was taken over by the British who controlled it until 1760 when France was able to get back control. In 1763 however, France ceded New France, which included Quebec City, to Great Britain. During the American Revolution, the Battle of Quebec took place in an effort to liberate the city from British control. However, revolutionary troops were defeated, which led to the splitting of British North America, instead of having Canada join the Continental Congress to become a part of the United States. Around this same time, the U.S. began to annex some Canadian lands, so construction of the Citadel of Quebec began in 1820 to protect the city. In 1840, the Province of Canada was formed and the city served as its capital for several years. In 1867, Ottawa was chosen to be the capital of the Dominion of Canada. When Ottawa was chosen as the capital of Canada, Quebec City became the capital of the province of Quebec. As of 2016, Quebec City had a population of 531,902 and its census metropolitan area had a population of 800,296. Most of the city is French-speaking. Native English speakers represent only 1.5% of the city's population. Today, Quebec City is one of Canada's largest cities. Most of the economy is based on transportation, tourism, the service sector, and defense. A large portion of the city's jobs are also through the provincial government since it is the capital city. The main industrial products from Quebec City are pulp and paper, food, metal and wood items, chemicals and electronics. Quebec City is located along Canada's Saint Lawrence River near where it meets the St. Charles River. Because it is located along these waterways, most of the city is flat and low-lying. However, the Laurentian Mountains are north of the city. In 2002, Quebec City annexed several nearby towns and because of its large size, the city is divided into 34 districts and six boroughs (the districts are included also in the six boroughs). The climate of Quebec City is variable as it lies at the boundaries of several climate regions; however, most of the city is considered humid continental. The summers are warm and humid, while winters are very cold and often windy. The average July high temperature is 77°F (25°C) while the average January low temperature is 0.3°F (-17.6°C). Average yearly snowfall is about 124 inches (316 cm)—this is one of the highest amounts in Canada. Quebec City is known for being one of the most visited places in Canada due to its various festivals—the most popular of which is the Winter Carnival. There are also many historic sites like the Citadel of Quebec and several museums.